For the main-belt asteroid, see 2644 Victor Jara. This name uses Spanish naming customs: the first or paternal family name is Jara and the second or maternal family name is Martínez. Víctor Lidio Jara Martínez (Spanish pronunciation: [ˈβiktoɾ ˈliðjo ˈxaɾa maɾˈtines]; 28 September 1932 – 16 September 1973) was a Chilean teacher, theater director, poet, singer-songwriter and political activist tortured and killed during the dictatorship of Augusto Pinochet. He developed Chilean theater by directing a broad array of works, ranging from locally produced plays to world classics, as well as the experimental work of playwrights such as Ann Jellicoe. He also played a pivotal role among neo-folkloric musicians who established the Nueva Canción Chilena (New Chilean Song) movement. This led to an uprising of new sounds in popular music during the administration of President Salvador Allende. In June 2016, a Florida jury found former Chilean Army officer Pedro Barrientos liable for Jara's murder. In July 2018, eight retired Chilean military officers were sentenced to 18 years and a day in prison for Jara's murder. 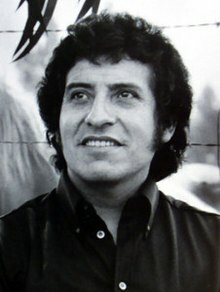 Víctor Jara was born in 1932 in San Ignacio, near Chillán, to two farmers, Manuel Jara and Amanda Martínez. His father was illiterate and encouraged his children to work from an early age to help the family survive, rather than attend school. By the age of 6, Jara was already working on the land. His father could not support the family on his earnings as a peasant at the Ruiz-Tagle estate, nor was he able to find stable work. He took to drinking and became increasingly violent. His relationship with his wife deteriorated, and he left the family to look for work when Víctor was still a child. Jara's mother raised him and his siblings, and insisted that they get a good education. A mestiza with deep Araucanian roots in southern Chile, she was self-taught, and played the guitar and the piano. She also performed as a singer, with a repertory of traditional folk songs that she used for local functions like weddings and funerals. She died when Jara was 15, leaving him to make his own way. He began to study to be an accountant, but soon moved into a seminary, where he studied for the priesthood. After a couple of years, however, he became disillusioned with the Catholic Church and left the seminary. Subsequently, he spent several years in army service before returning to his hometown to pursue interests in folk music and theater. After joining the choir at the University of Chile in Santiago, Jara was convinced by a choir-mate to pursue a career in theater. He subsequently joined the university's theater program and earned a scholarship for talent. He appeared in several of the university's plays, gravitating toward those with social themes, such as Russian playwright Maxim Gorky's The Lower Depths, a depiction of the hardships of lower-class life. In 1957, he met Violeta Parra, a singer who had steered folk music in Chile away from the rote reproduction of rural materials toward modern song composition rooted in traditional forms, and who had established musical community centers called peñas to incorporate folk music into the everyday life of modern Chileans. Jara absorbed these lessons and began singing with a group called Cuncumén, with whom he continued his explorations of Chile's traditional music. He was deeply influenced by the folk music of Chile and other Latin American countries, and by artists such as Parra, Atahualpa Yupanqui, and the poet Pablo Neruda. In the 1960s, Jara started specializing in folk music and sang at Santiago's La Peña de Los Parra, owned by Ángel Parra. Through these activities, he became involved in the Nueva Canción movement of Latin American folk music. He released his first album, Canto a lo humano, in 1966, and by 1970, he had left his theater work in favor of a career in music. His songs were inspired by a combination of traditional folk music and left-wing political activism. From this period, some of his best-known songs are "Plegaria a un Labrador" ("Prayer to a Worker") and "Te Recuerdo Amanda" ("I Remember You Amanda"). Early in his recording career, Jara showed a knack for antagonizing conservative Chileans, releasing a traditional comic song called "La beata" that depicted a religious woman with a crush on the priest to whom she goes for confession. The song was banned on radio stations and removed from record shops, but the controversy only added to Jara's reputation among young and progressive Chileans. More serious in the eyes of the Chilean right wing was Jara's growing identification with the socialist movement led by Salvador Allende. After visits to Cuba and the Soviet Union in the early 1960s, Jara had joined the Communist Party. The personal met the political in his songs about the poverty he had experienced firsthand. Jara's songs spread outside Chile and were performed by American folk artists. His popularity was due not only to his songwriting skills but also to his exceptional power as a performer. He took a decisive turn toward political confrontation with his 1969 song "Preguntas por Puerto Montt" ("Questions About Puerto Montt"), which took direct aim at a government official who had ordered police to attack squatters in the town of Puerto Montt. The Chilean political situation deteriorated after the official was assassinated, and right-wing thugs beat up Jara on one occasion. In 1970, Jara supported Allende, the Popular Unity coalition candidate for president, volunteering for political work and playing free concerts. He composed "Venceremos" ("We Will Triumph"), the theme song of Allende's Popular Unity movement, and welcomed Allende's election to the Chilean presidency in 1970. After the election, Jara continued to speak in support of Allende and played an important role in the new administration's efforts to reorient Chilean culture. He and his wife, Joan Jara, were key participants in a cultural renaissance that swept Chile, organizing cultural events that supported the country's new socialist government. He set poems by Pablo Neruda to music and performed at a ceremony honoring him after Neruda received the Nobel Prize in Literature in 1972. Throughout rumblings of a right-wing coup, Jara held on to his teaching job at Chile's Technical University. His popular success during this time, as both a musician and a Communist, earned him a concert in Moscow. So successful was he that the Soviet Union tried to latch onto his popularity, claiming in their media that his vocal prowess was the result of surgery he had undergone while in Moscow. Backed by the United States, which opposed Allende's socialist politics, the Chilean right wing staged a coup d'état on September 11, 1973, resulting in the death of Allende and the installation of Augusto Pinochet as dictator. At the moment of the coup, Jara was on his way to the Technical University (today the Universidad de Santiago). That night, he slept at the university along with other teachers and students, and sang to raise morale. Víctor Jara's grave in the General Cemetery of Santiago. The note reads: "Until victory..."
After the coup, Pinochet’s soldiers rounded up Chileans who were believed to be involved with leftist groups, including Allende’s Popular Unity party. On the morning of 12 September 1973, Jara was taken prisoner, along with thousands of others, and interned in Chile Stadium. The guards there tortured him, smashing his hands and fingers, and then mocked him by asking him to play the guitar. Soon after, he was killed with a gunshot to the head, and his body was riddled with more than 40 bullets. After his murder, Jara's body was displayed at the entrance of Chile Stadium for other prisoners to see. It was later discarded outside the stadium along with the bodies of other civilian prisoners who had been killed by the Chilean Army. His body was found by civil servants and brought to a morgue, where one of them was able to identify him and contact his wife, Joan. She took his body and gave him a quick and clandestine burial in the general cemetery before she fled the country into exile. Forty-five years later, former Chilean military officers were charged with his murder. On 16 May 2008, retired colonel Mario Manríquez Bravo, who was the chief of security at Chile Stadium as the coup was carried out, was the first to be convicted in Jara's death. Judge Juan Eduardo Fuentes, who oversaw Bravo's conviction, then decided to close the case, a decision Jara's family soon appealed. In June 2008, Judge Fuentes re-opened the investigation and said he would examine 40 new pieces of evidence provided by Jara's family. On 28 May 2009, José Adolfo Paredes Márquez, a 54-year-old former Army conscript arrested the previous week in San Sebastián, Chile, was formally charged with Jara's murder. Following his arrest, on 1 June 2009, the police investigation identified the officer who had shot Jara in the head. The officer played Russian roulette with Jara by placing a single round in his revolver, spinning the cylinder, placing the muzzle against Jara's head, and pulling the trigger. The officer repeated this a couple of times until a shot fired and Jara fell to the ground. The officer then ordered two conscripts (one of them Paredes) to finish the job by firing into Jara's body. A judge ordered Jara's body to be exhumed in an effort to gather more information about his death. On 3 December 2009, Jara was reburied after a massive funeral in the Galpón Víctor Jara, across from Santiago's Plaza Brasil. On 28 December 2012, a judge in Chile ordered the arrest of eight former army officers for alleged involvement in Jara's murder. He issued an international arrest warrant for one of them, Pedro Barrientos Núñez, the man accused of shooting Jara in the head during a torture session. On 4 September 2013, Chadbourne & Parke attorneys Mark D. Beckett and Christian Urrutia, with the assistance of the Center for Justice and Accountability, filed suit in a United States court against Barrientos, who lives in Florida, on behalf of Jara's widow and children. The suit accused Barrientos of arbitrary detention; cruel, inhuman, or degrading treatment or punishment; extrajudicial killing; and crimes against humanity under the Alien Tort Statute (ATS), and of torture and extrajudicial killing under the Torture Victim Protection Act (TVPA). It alleged that Barrientos was liable for Jara's death as a direct perpetrator and as a commander. On 11 September 1973, troops from the Arica Regiment of the Chilean Army, specifically from La Serena, attacked the university where Jara taught. The troops prohibited civilians from entering or leaving the university premises. During the afternoon of 12 September 1973, military personnel entered the university and illegally detained hundreds of professors, students, and administrators. Víctor Jara was among those arbitrarily detained on the campus and was subsequently transferred to Chile Stadium, where he was tortured and killed. In the course of transporting and processing the civilian prisoners, Captain Fernando Polanco Gallardo, a commanding officer in military intelligence, recognized Jara as the well-known folk singer whose songs addressed social inequality, and who had supported President Allende's government. Captain Polanco separated Jara from the group and beat him severely. He then transferred Jara, along with some of the other civilians, to the stadium. Throughout his detention in the locker room of the stadium, Jara was in the physical custody of Lieutenant Barrientos, soldiers under his command, or other members of the Chilean Army who acted in accordance with the army's plan to commit human rights abuses against civilians. The arbitrary detention, torture, and extrajudicial killing of Jara and other detainees were part of a widespread, systematic attack on civilians by the Chilean Army from 11–15 September 1973. Barrientos knew, or should have known, about these attacks, if for no other reason than that he was present for and participated in them. On 15 April 2015, a US judge ordered Barrientos to stand trial in Florida. On 27 June 2016, he was found liable for Jara's killing, and the jury awarded Jara's family $28 million. On 3 July 2018, eight retired Chilean military officers were sentenced to 15 years in prison for Jara's murder, and also the murder of his Communist associate and former Chilean prison director Littre Quiroga Carvajal. They also received three extra years for kidnapping both men as well. A ninth suspect was sentenced to five years in prison for covering up the murders as well. Joan also distributed recordings of her husband's music, which became known worldwide. His music began to resurface in Chile in 1981. Nearly 800 cassettes of early, nonpolitical Jara songs were confiscated on the "grounds that they violated an internal security law". The importer was given jail time but released six months later. By 1982, Jara’s records were being openly sold throughout Santiago. Jara is one of many desaparecidos (people who vanished under the Pinochet government and were most likely tortured and killed) whose families are still struggling to get justice. Thirty-six years after his first burial, he received a full funeral on 3 December 2009 in Santiago. Thousands of Chileans attended his reburial, after his body was exhumed, to pay their respects. President Michelle Bachelet—also a victim of the Pinochet regime, having spent years in exile—said: "Finally, after 36 years, Victor can rest in peace. He is a hero for the left, and he is known worldwide, even though he continues buried in the general cemetery where his widow originally buried him." Jara has been commemorated not only by Latin American artists, but also by global bands such as U2 and The Clash. U2 has given concerts at Chile' National Stadium in homage not only to Jara, but also to the many others who suffered under the Pinochet dictatorship. Although most of the master recordings of Jara's music were burned under Pinochet's military dictatorship, his wife managed to get recordings out of Chile, which were later copied and distributed worldwide. She later wrote an account of Jara's life and music titled Víctor: An Unfinished Song. Rolling Stone named him one of the fifteen top protest artists. On 22 September 1973, less than two weeks after Jara's death, the Soviet astronomer Nikolai Stepanovich Chernykh named a newly found asteroid 2644 Víctor Jara. The American folk singer Phil Ochs, who met and performed with Jara during a tour of South America, organized a benefit concert in his memory in New York in 1974. Titled "An Evening With Salvador Allende", the concert featured Ochs, Bob Dylan, Pete Seeger, and Arlo Guthrie. The anthology For Neruda, for Chile contains a section called "The Chilean Singer", with poems dedicated to Jara. An East German biographical movie called El Cantor ("The Singer") was made in 1978. It was directed by Jara's friend Dean Reed, who also played the part of Jara. That same year, the Dutch-Swedish singer-songwriter Cornelis Vreeswijk released an album of Jara songs translated into Swedish, Cornelis sjunger Victor Jara ("Cornelis sings Victor Jara"). In 1989 Simple Minds dedicated Street Fighting Years track to Victor Jara. In the late 1990s, British actress Emma Thompson started to work on a screenplay that she planned to use as the basis for a movie about Jara. Thompson, a human rights activist and fan of Jara, saw his murder as a symbol of human rights violations in Chile, and believed a movie about his life and death would raise awareness. The movie was to feature Antonio Banderas as Jara and Thompson as his wife, Joan. However, the project was not completed. English poet Adrian Mitchell translated Jara's poems and lyrics and wrote the tribute "Víctor Jara", which Guthrie later set to music. The Soviet musician Alexander Gradsky created the rock opera Stadium (1985) based on the events surrounding Jara's death. The Portuguese folk band Brigada Víctor Jara is named after him. Bruce Springsteen and the E Street Band's Wrecking Ball Tour made a stop in Chile on 12 September 2013, just days before the 40th anniversary of Jara's death. Springsteen, guitarist Nils Lofgren and trumpet player Curt Ramm paid tribute to Jara by covering his song "Manifiesto", which Springsteen sang in Spanish. In a short speech before the song, Springsteen said (in Spanish): "In 1988, we played for Amnesty International in Mendoza, Argentina, but Chile was in our hearts. We met many families of desaparecidos, which had pictures of their loved ones. It was a moment that stays with me forever. If you are a political musician, Víctor Jara remains a great inspiration. It’s a gift to be here, and I take it with humbleness." "Cancion Protesta" by Aterciopelados, a Colombian rock band, is a tribute to protest songs. The music video makes visual a quote from Jara, who said, "The authentic revolutionary should be behind the guitar, so that the guitar becomes an instrument of struggle, so that it can also shoot like a gun." "The Manifest - Epilogue" by the israeli band Orphaned Land, a song from the 2018 album "Unsung Prophets & Dead Messiahs" features a quote from Victor Jara. The line is "Canto que ha sido valiente, Siempre será canción nueva". In Barnstormer's album Zero Tolerance (2004), Attila the Stockbroker mentions Jara in the song "Death of a Salesman", written just after the September 11 attacks on the World Trade Center. "You were there in Chile, 11 September '73. 28 years to the day – what a dreadful irony. Victor Jara singing 'midst the tortured and the dead. White House glasses clinking as Allende's comrades bled." Belgian singer Julos Beaucarne relates Jara's death in his song "Lettre à Kissinger" ("Letter to Kissinger"). British musician Marek Black's record I Am A Train (2009) features the song "The Hands of Victor Jara". In 1976, French singer fr: Jean-Max Brua dedicated to him a song called "Jara" on his album La Trêve de l’aube. The Turkish protest-rock band Bulutsuzluk Özlemi refer to Jara in their song "Şili'ye Özgürlük" ("Freedom to Chile"), part of their 1990 album Uçtu Uçtu. In 2004, Swiss singer fr: Michel Bühler released "Chanson pour Victor Jara" on his album Chansons têtues (EPM). The Tucson, Arizona-based band Calexico included a song called "Víctor Jara's Hands" on their 2008 album Carried to Dust. French singer Pierre Chêne also wrote a song about Jara's death, titled "Qui Donc Était Cet Homme?" As every cell in Chile will tell, the cries of the tortured men. Remember Allende in the days before, before the army came. 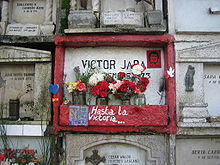 Please remember Victor Jara, in the Santiago Stadium. Es verdad, those Washington bullets again. "Decadencia", a song by Cuban rap group Eskuadron Patriota, mentions Jara in the line: "Como Víctor Jara diciéndole a su pueblo: La libertad está cerca". The Argentine rock group Los Fabulosos Cadillacs remember Jara in their song "Matador", with the lyrics "Que suenan/son balas/me alcanzan/me atrapan/resiste/Víctor Jara no calla" ("What is that sound/It's bullets/They reach me/They trap me/Resist/Víctor Jara is not silent"). The German hip hop band Freundeskreis mention Jara in their song "Leg dein Ohr auf die Schiene der Geschichte" ("Put your ear on the rails of history"), released in 1997. The song also includes a short sample of Jara singing. The San Francisco post-rock band From Monument to Masses includes excerpts from a reading of Jara's "Estadio Chile" on the track "Deafening", a song from their 2005 remix album Schools of Thought Contend. In 1976, Arlo Guthrie included a biographical song titled "Victor Jara" on his album Amigo. The lyrics were written by Adrian Mitchell, and the music by Guthrie. American singer-songwriter Jack Hardy (1947–2011) mentioned Jara in "I Ought to Know", a song included on the album Omens in 2000. Heaven Shall Burn wrote and performed two songs about Jara and his legacy: "The Weapon They Fear" and "The Martyrs Blood". In 1975, the Swedish band Hoola Bandoola Band included the song "Victor Jara" on their album Fri information. The Chilean group Inti-Illimani dedicated the songs "Canto de las estrellas" and "Cancion a Víctor" to Jara. Welsh folk singer-songwriter Dafydd Iwan wrote a song called "Cân Victor Jara" ("Victor Jara's Song"), released on his 1979 album Bod yn rhydd ("Being free"). Scottish singer-songwriter Bert Jansch wrote "Let Me Sing" about Jara. Belarusian composer Igor Lutchenok wrote "In memory of Victor Jara", with lyrics by Boris Brusnikov. It was first performed in 1974 by Belarusian singer Victor Vuyachich, and later by the Belarusian folk-rock group Pesniary, with an arrangement by Vladimir Mulyavin. American singer-songwriter Rod MacDonald wrote "The Death of Victor Jara" in 1991, with the refrain "the hands of the poet still forever wave." The song appears on his And Then He Woke Up record. MacDonald met Phil Ochs on the eve of Ochs' 1973 concert, and sang for him a song he had just written about the Chilean coup. The title song on Rory McLeod's album Angry Love is about Jara. In 2011, London-based band The Melodic released a track titled "Ode to Victor Jara" as the B-side to their limited-release vinyl single "Come Outside". Finnish punk rocker Pelle Miljoona mentions Jara in his song "Se elää". Irish folk artist Christy Moore included the song "Victor Jara" on his This Is The Day album. "The Junta took the fingers from Victor Jara's hands. Well Victor started singing until they shot his body down. You can kill a man, but not a song when it's sung the whole world round." The Swedish band "Hoola bandoola band" wrote a song with te name "Victor Jara"
In 1975, Norwegian folksinger Lillebjørn Nilsen included a tribute song titled "Victor Jara" in his album Byen Med Det Store Hjertet. "Ki an eimai rock", a song released in 2011 by Greek rock singer Vasilis Papakonstantinou, refers to Jara. San Francisco ska-punk band La Plebe mentions Jara on their song "Guerra Sucia" from their album Brazo En Brazo. Venezuelan singer-songwriter Alí Primera wrote his "Canción para los valientes" ("Song to the Brave") about Jara. The song was included in an album of the same name in 1976. The Peruvian ska band Psicosis mentions Jara in their song "Esto es Ska". The chorus says, "Lo dijo Víctor Jara no nos puedes callar" ("Victor Jara said it, you can't silence us"). The song "Broken Hands Play Guitars" by Rebel Diaz (a political hip-hop duo consisting of the Chilean brothers Rodrigo Venegas, known as RodStarz, and Gonzalo Venegas, known as G1), mixed by DJ Illanoiz, is a tribute to Jara. With her Back against the wall"
Spanish singer Ismael Serrano mentioned Jara's name, and the name of his song "Te Recuerdo Amanda", in his own song, "Vine del Norte", on the 1998 album La Memoria de los Peces. Scottish group Simple Minds released a 1989 album, Street Fighting Years, dedicated to Jara. And right up to his death he shouted 'Revolution'. In Suren Tsormudian's "Ancestral Heritage" ("Наследие предков", Nasledye pryedkov), a 2012 entry in Universe of Metro 2033, Jara's fate is mentioned. However, the book repeats the common misconception that it was Estadio Nacional that was named after him. In 1987, U2 included the track "One Tree Hill" on their album The Joshua Tree, in which Bono sings: "And in the world, a heart of darkness, a fire zone/Where poets speak their heart, then bleed for it/Jara sang, his song a weapon in the hands of love/Though his blood still cries from the ground." Dutch-Swedish singer-songwriter Cornelis Vreeswijk recorded the album "Cornelis sings Victor Jara" (https://en.wikipedia.org/wiki/Cornelis_sjunger_Victor_Jara) in 1978 and later recorded "Blues för Victor Jara" on his album Bananer – bland annat in 1980. German singer Hannes Wader released his song "Victor Jara" on his album Wünsche (2001). The Scottish-Irish folk group The Wakes included a song called "Víctor Jara" on their album These Hands in 2008. Marty Willson-Piper, guitar player from The Church, included "Song for Victor Jara" on his 2009 solo album, Nightjar. British jazz-dance band Working Week's debut single "Venceremos (We Will Win)", from their 1985 album Working Nights, is a tribute to Jara. Former German folk duo Zupfgeigenhansel (Thomas Friz and Erich Schmeckenbecher) featured a live performance of their song "Victor Jara" as the last track on their 1978 LP Volkslieder III. 1972. Directed a ballet and musical homage to Pablo Neruda, which coincided with Neruda's return to Chile after being awarded the Nobel Prize for Literature. ^ "Report of the Chilean Commission on Truth and Reconciliation Part III Chapter 1 (A.2)". usip.org. 10 April 2002. Archived from the original on 31 December 2006. Retrieved 6 January 2007. ^ "Jara v. Barrientos". Center for Justice and Accountability. 4 July 2013. Retrieved 3 October 2014. ^ Charlotte Karrlsson-Willis (6 September 2013). "Family of Víctor Jara turns from Chile to US in quest for justice". The Santiago Times. Archived from the original on 6 October 2014. Retrieved 3 October 2014. ^ Former Chilean Army Officer Found Liable for 1973 Murder of Víctor Jara After U.S.-Backed Coup. Democracy Now! June 29, 2016. ^ Peter Kornbluh (July 2016). Justice, Finally, for One of Pinochet’s Most Famous Victims. The Nation. ^ "Victor Jara murder: ex-military officers sentenced in Chile for 1973 death". Reuters in Santiago via The Guardian. 3 July 2018. Retrieved 4 July 2018. ^ a b c d "Victor Jara Biography - life, family, childhood, children, parents, death, wife, school". www.notablebiographies.com. Retrieved 22 October 2015. ^ Mularski, Jedrek. Music, Politics, and Nationalism in Latin America: Chile During the Cold War Era. Amherst: Cambria Press. ISBN 9781604978889. ^ Minkova, Yuliya (2013). OUR MAN IN CHILE, OR VICTOR JARA'S POSTHUMOUS LIFE IN SOVIET MEDIA AND POPULAR CULTURE. Virginia Tech. p. 608. ^ Hitchens, Christopher (2001). The Trial of Henry Kissinger. New York: Twelve. p. 304. ISBN 978-1455522972. ^ "Stadium's Renaming an Ode to Singer Martyred There". Los Angeles Times. 9 September 2003. Retrieved 12 August 2011. ^ "Victor Jara - Chilean musician". Retrieved 20 July 2016. ^ a b c d "Complaint: Jara v. Barriento" (PDF). Official Florida court legal filing. Retrieved 5 September 2013. ^ "Former Chilean military officers charged in 1973 murder of singer Víctor Jara". The Guardian. 23 July 2015. Retrieved 23 July 2015. ^ a b c Reuters (16 May 2008). "Judge rules in Pinochet-era case of murdered singer". Stuff.co.nz. Retrieved 6 June 2015. ^ "New probe into Victor Jara murder". BBC News. 4 June 2008. Retrieved 27 May 2010. ^ "Chilean singer Jara is exhumed". BBC. 4 June 2009. Retrieved 5 June 2009. ^ "A oficial que ajustició a Víctor Jara, le decían "El Loco"". Red Nacion. Archived from the original on 17 October 2013. Retrieved 17 October 2013. ^ Carroll, Rory. "Ex-Pinochet army conscript charged with folk singer Victor Jara's murder". The Guardian. Retrieved 17 October 2013. ^ "Chile: A Proper Funeral for Víctor Jara". Global Voices Online. 5 December 2009. Retrieved 6 December 2009. ^ Mariano Castillo (29 December 2012). "Charges brought in Chilean singer's death, 39 years later". CNN. ^ "Ex-army officers implicated in Victor Jara death". BBC. 28 December 2012. Retrieved 18 July 2013. ^ "Mark D. Beckett | Chadbourne & Parke LLP". www.chadbourne.com. Retrieved 16 July 2016. ^ "Christian Urrutia | Chadbourne & Parke LLP". www.chadbourne.com. Retrieved 16 July 2016. ^ "Clients | CJA". Retrieved 28 August 2016. ^ "Jara v. Barrientos No. 3:13-cv-1075-J-99MMH-JBT (2013)". Center for Justice and Accountability. 4 September 2013. Retrieved 5 September 2013. ^ "Victor Jara killing: Chile ex-army officer faces US trial". Retrieved 15 April 2015. ^ Luscombe, Richard (27 June 2016). "Former Chilean military official found liable for killing of Victor Jara". The Guardian. Retrieved 10 July 2016. ^ a b De la Jara, Antonio; Laing, Aislinn (3 July 2018). "Eight Chilean military officers sentenced for singer Victor Jara's murder". Reuters. Retrieved 19 November 2018. ^ a b c "Victor Jara killing: Nine Chilean ex-soldiers sentenced". BBC News. 4 July 2018. Retrieved 24 January 2019. ^ "FUNDACION VICTOR JARA". Retrieved 20 July 2016. ^ Waldstein, David. The New York Times, 18 June 2015. Web. 9 December 2015. "In Chile’s National Stadium, Dark Past Shadows Copa América Matches"
^ E., Morris, Nancy (1 July 1984). "Canto porque es necesario cantar: The New Song Movement in Chile, 1973-1983". Retrieved 20 July 2016. ^ Henao, Luis A. (23 July 2015). "10 Former Chilean Soldiers Charged in Victor Jara Killing". The Washington Times. Retrieved 14 June 2016. ^ a b Long, Gideon. The Guardian. Guardian News and Media Limited, 5 December 2009. Web. 8 December 2015. "Murdered Chilean Folk Singer Laid to Rest after 36 Years"
^ Lowenfels 1975, pp. 79–90. ^ Stasio, Marilyn (Fall 1998). "Emma Thompson: The World's Her Stage". ontheissuesmagazine.com. ^ Beatrice Sartori (7 January 1999). "Antonio Banderas se mete en la piel del poeta torturado". elmundo.es. Retrieved 3 February 2006. ^ "Springsteen News". Backstreets.com. Retrieved 20 May 2014. ^ "Pense oir al dulce Victor en la noche cantar". Estribillo: 'No se rindan, no se rindan, no se rindan ya! A la justicia cantemos, no se rindan ya! ^ Julos Beaucarne – Lettre a Kissinger. 10 December 2011. ^ "Music". Chuck Brodsky. Retrieved 18 July 2013. ^ "Rod MacDonald Band The Death Of Victor Jara". youtube.com. Retrieved 24 February 2017. ^ "Brief Descriptions of some of Rory's recorded and released songs". Rorymcleod.com. Retrieved 18 July 2013. ^ "La memoria de los peces (1998)". Ismael Serrano. Archived from the original on 1 May 2012. Retrieved 1 May 2012. ^ Oliver, William (1967). "Marat/Sade in Santiago". Educational Theatre Journal. JSTOR 3205029. ^ An Evening with Salvador Allende was a recording of the Friends of Chile benefit concert held in New York City (1974) to honor Allende, Neruda and Víctor Jara. The double album appeared as a limited edition several years after the concert event; it was never reissued after its limited release. It featured Melanie, Bob Dylan, the Beach Boys, Phil Ochs and it was where Pete Seeger for the first time performed an English translation of Víctor Jara's last poem: Estadio Chile. Lowenfels, Walter (1975). For Neruda, for Chile: An International Anthology. Boston: Beacon Press. ISBN 978-0-8070-6383-5. Retrieved 26 September 2013. Allende’s Poet. Nick MacWilliam for Jacobin, August 2, 2016.